FROSTYBALLS had the most liked content! Use a tyre calculator which also provides the effect on the speedometer - eg. https://www.autopartuk.com/tyre-calculator/ As regards the speedometer it is illegal for a speedometer to show less than the true speed (under read). If you do change, need to inform your insurer as it will probably count as a modification. Well as I pointed out earlier, one can download the full owners manual - which will help you until you get the printed abbreviated version. It is your choice as to whether you wish to download the full manual now or wait for however long it takes. The owners manual supplied with new Toyotas is an abbreviated version. See my post of Tuesday 01.27am re downloading the full owners manual. For the past four years or so, Toyota have supplied abbreviated owners manuals with new cars, with full owners manuals available to download from My Toyota or purchase from dealers. As regards the cover for the usb socket, as it is a used car, I suspect the previous owner may have broken off the cover. As far as I'm aware cda files aren't audio files. You would probably be best to copy the files as MP3, WMA or similar. The owners manual isn't just used for the UK, so the reference to the PSA HM01 engine is relevant to some markets. 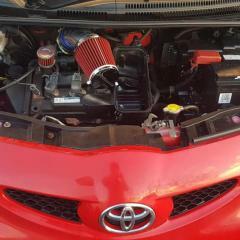 All UK Aygos have the Toyota 1KR engine (1.0 litre). In the UK dealers usually use 0W-20 for hybrids as a matter of course. However, for petrol models some use 5W-30. I always request 0W-20 be used, and additionally have the use of this oil written into my service plan. It may be different in your country. Economy isn't the only reason for Toyota recommending 0W-20 - easier starting (especially in cold westher) is the other reason. HVO 100 (ie 100% HVO diesel) diesel isn't available in the UK. HVO is used as a percentage in some bio-diesels and in the UK that percentage is limited to 5%. So the use of HVO in bio diesel will have an effect but not enough to make a great impact on emissions at the percentage which is currently allowed I know in Sweden, Volvo started a trial last year using HVO 100 in a fleet of taxis, but don't think the results are out yet. Think the only realistic way of monitoring vehicles entering areas like Clean Air Zones is the Euro standard (eg Euro 4 and 6) - where the registration numbers of vehicles entering the Clean Air Zones are captured electronically, and those vehicles which don't meet the Euro standard are charged accordingly. Prius+ hubcap / wheel side cover / fuel consumption ? Presumably the reason for the flush fitting wheel trims is to reduce drag. So removing them would probably increase fuel consumption by a percentage. Toyota owners manuals for Optimal Drive petrol engines state that the recommended engine oil is 0W-20. 5W-30 may be used, but should be replaced with 0W-20 at the next oil change. Some dealers use 5W-30 as under Block Exemption, Toyota cannot insist a particular oil is used. Yaris 1.3 auto wouldn't brake !